One of the greatest pleasures of winters is big able to come home after a long day and slip into a warm and inviting bed. To us, this luxurious opportunity is dearer than the cool respite of a lemonade during summers. The coziness cannot be obtained from layers and layers of blanket alone without feeling like an avalanche rolled over you. Enter electric heated mattress pads. Lay them as the top layer of your bedding for an all-engulfing heat that even electric blanket find hard to parallel. There are some key features to consider while selecting the best heated mattress pads for yourself. So we did the research for you and found the 10 best products from the best mattress brands in this category spread across price range and quality. What to look for in a good heated mattress pad? Which is better: heated mattress pad or blanket? Which are the best heated mattress pad? This begs the question what exactly are mattress pads and how do they work. Electric heated mattress pads are the size of your entire bed and go over the actual mattress to provide warmth from below your body. The heat is produced by a resistive wire passing through resistive wire heating element weaved inside the mattress. Most of these pads operate on AC power while some also work on DC power. Thermostat and timer for heating are common features. Safety: We think of heated mattress pads as electronic equipment first and bedding next. Your body will be in close contact with them for a long period of time so it’s important they follow all the safeguards of home appliances. We looked at the reliability of the electric arrangement checking that there aren’t any loose ends. The power cord has to be located non-invasivelyso that you don’t inadvertently disconnect it. A timer is quite useful if you don’t want the mattress pad running all day long. Heated mattress pads are generally deemed safe for pregnant women since they are unlikely to raise your body temperature to unsuitable levels. But we would still suggest that you turn down the temperature. It’s advised to remove the pad around 36 weeks of pregnancy, in case your water breaks while your sleep. People with other health issues and circulatory system problems should consult their doctors before using these. Quality: Like all electronics, we expect the electric heated mattress pads to have durable circuitry inside. A look at the warranty period will tell you whether the manufacturer is ready to stand behind their product. The material of pad is also important since you will be lying on it. The thread count of the cover will determine the softness and feel of the material. The better the quality, the easier it will be to fold, lay and in general handle the mattress pad while you move or clean it. Size and fitment: The electric mattress pads available in different sizes like King, Queen and Twin are generally more preferable than standard size pads. This would allow you to fit them on the bed you choose. Most of the mattress pads come with an elastic skirt that allows you to fit them snugly on the basic mattress. This way they won’t move while you toss and turn in the night. 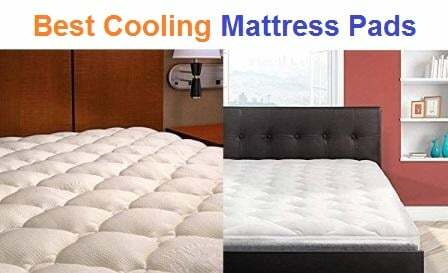 Features: Temperature control is one of the most important features to look for in the heated mattress pads. Everybody has different heat preferences for winter based on whether they are a hot or cold sleeper. A thermostat with clear indication of temperature allows you to regulate the heat according to changing weather. A timer that automatically shuts down the heating after a certain period of time will also help keep your peace of mind through the night. Convenience:The ease of operating the controls of the heated mattress pads is of great importance. When you reach out groggily from your sleep to turn down the temperature, the controls should respond immediately. 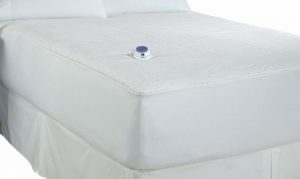 Thinner but sturdy wires lend a flexibility to quality mattress pads making their general use easy. The positioning of controls and power cord are important to the bed arrangement. Heated mattress pad vs. electric blanket is a raging debate. But mattress pads come out on the winning side based on simple logic. What makes them better than electric heated blankets, you ask? Heated mattress pads trump electric blankets in terms of safety. Bunching up the resistance wires can cause overheating of the blanket. A mattress pads lies flat on the bed so it is less likely to be bunched up. The heat rising from the heated mattress pads is directed at the body, so we make efficient use of the pad’s heating. Whereas only half the heat from electric blanket is directed at the body. The rest disperses to the ceiling thus reducing its heating efficiency. Mattress pads last longer since they simply lie on the bed. They aren’t manhandled like the electric blankets. This adds to the life of their electronic circuitry. There’s nothing to stop you from using mattress pads as blankets either. The elastic skirting might be the only issue. But electric blankets are not too versatile. Heating ability: We checked that these best electric heated mattress pads can provide the required warmth through moderate to heavy winters. The range of temperature on the thermostat should give you a fair idea of whether the pad is enough for your purposes. Safety: We checked the spec provided by the manufacturers and usual certifications to see whether these best electric mattress pads follow all safety regulations. We selected most products that confirm to the UL964 standards for heated mattress pads regulations. Durability: This is immediately apparent from the specs and the feel of the mattress pads. We checked that both the electrical and non-electricalparts of the mattress pads are made of quality components that can survive the weight of humans. Ease of operation:The mattress pads need to have accessible controls with proper indication of the temperature and timer settings. The power cord placement also plays a big role here. The ability to wash the pad in a machine and move it comfortably is a big plus. Budget: We selected the best electric heated mattress pads in a range of budgets, just so that warmth is never away from you no matter how much your budget is. Sunbeam is aptly named as their products bring the comfort of a warm sunbeam during winters. The Sunbeam All Season Premium heated mattress pad is a product for the cold states where the chill never subsides, come winter or summer. The versatile range of temperature settings allows you to use it all seasons through. The standard King and Queen sizes ensure that they will fit a wide variety of beds. This is only the tip of the brilliant design which makes it one of our best heated mattress pads. The Sunbeam All Season Premium heated mattress pad shows no signs of being a budget product. At the surface, you see a quilted design which pretty much looks like the top of a mattress. With its complete heating element, the weight comes up to 8.4 pounds. The King and Queen size of this mattress pad fit beds up to 21” deep. The dimensions of King size mattress pad are 76”x 80”. The Queen size runs 60”x 80”. The cover of the mattress pad is made of 250 thread count soft cotton that’s plush to lie on. The most notable feature of this heated mattress pad is that it has two heating zones which can be controlled independently of each other through separately attached controllers. So if the two users of the same mattress can set different temperatures or heat settings based on individual preference. The other person will not be hindered by your choice to toast to Florida summer. The other thing that caught our eye is the pre-heat setting. In the relatively warmer months, you can pre-heat the mattress pad and then switch off heat in case you don’t need it all night long. It will make the bed warm and toasty before you slip in. You can set one heating zone on pre-heat and the other on continuous heat as well. The Sunbeam All Season heated mattress pad provides 10 different heat settings per heating zone. Based on the intensity of cold, you can choose the setting that suits you the best. The controllers are about the size of a mouse with buttons and an LCD screen. The numbers appear on the green background in black color. The numbers would have been more readable in a red font. That would make it easier to read at the night because that’s usually when people try to regulate the temperature. You need to connect it to usual 110-120V AC supply for heating. Soft Heat has the distinction of being the only mattress pad manufacturer that confirms the UL standards of non-hazardous low voltage. The same sense of safety boils over to their best product, the Micro-plush electric heated mattress pad. They have an exceptional design that makes them an aesthetically and physically pleasing topping for your mattress. The choice of sizes and the customizable temperature settings land it on the top spot on the best heated mattress pads list. The Soft Heat Micro-Plush electric heated mattress pad is one of the safest, most user-friendly mattresses we have used. The fact that it stands apart from other products is evident right from its micro-velour top. Its soft and plush feel are accompanied by the velveteen texture of velour on the top. It is available in King, Queen, Cal King and Twin sizes. It will fit the mattresses up to a depth of 18”. 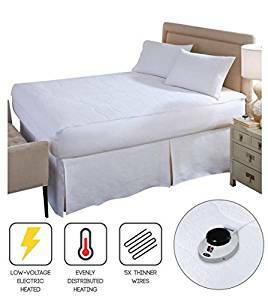 This UL-certified heated mattress pad converts the 120V AC power to less than 25V DC power, thus making it all the more safer than the usual electric mattress pads. This dramatically reduces your electricity bill and reduces the risk of overheating. It is also equipped with over-temperature protection circuit for an extra peace of mind while sleeping. Instead of the bulky wires used by the 20-year old legacy technology of Sunbeam, this Soft Heat mattress uses very thin resistance wires spaced 3 inches from each other. The resulting heat is more uniformly distributed along the mattress than any competition. So you get uniform temperature from head to toe without any cold spots. Also, the thinner wires provide better back support and don’t dig into your skin compared to beefy wires. The Micro-plush heated mattress pad has two heating zones where the temperature can be set independently. Based on the individual heat preferences, each sleeper can select the temperature setting. It also has a pre-heat mode which you can switch on and forget. This way when you slip into the bed it will be comfortably warm. You can also only use the pre-heat and let a light blanket do the rest in the relatively warmer months. The temperature control is through two non-slip controllers with digital display. The settings are displayed against a backlight which dims automatically so as not to disturb your sleep. There are 10 heat settings to choose from which caters to your heating requirements all year long. Another feature that contributes both to your safety and energy conservation is the auto power-off after 10 hours. So you get through the night without needing to touch the controller at all. And you don’t have to worry about forgetting to switch it off after the night’s use. Soft Heat offers a limited 5-year warranty on this heated mattress pad. It can be disconnected from the power cord and machine washed. It can also be tumble-dried at low heat in the dryer. The Sunbeam Vertical Quilted heated mattress pad is a highly efficient and easy to use device. For all our warming needs, it anticipated and intuitively delivered to our demands. This polyester pad can be used year-round with its wide range of temperature settings. It can also be customized to individual preferences on a 2-person bed. Sunbeam’s commitment to quality is reflected in the safety and heating capacity of this pad, hence its place in the best heated mattress pads list. The Sunbeam Vertical Quilted heated mattress pad looks pretty classy for a budget bedding. It acquires its name from the vertical quilting pattern that runs from its top to bottom end. It is filled with 5 ounces of fill for some added warmth. It’s a thin mattress pad though without the plushness of the Soft Heat mattress pad. You find it in King, Queen, Full and Twin sizes. The skirting of this pad are generously long at around 19 inches. So it can easily fit the standard 18”mattresses. The pad is made of 100% polyester with 140 thread count. It is soft with a nice presentable texture. This heated mattress pad has a dual zone control. Assuming two sleepers per bed, each one gets to control the temperature based on her/his preferences. You won’t feel the higher temperature on the other side unless you cross over the border. The controls and the power cord are installed near the foot-end of the mattress, as per instructions. However, most users end up laying it near the top side because headboards have the connection points. The controllers of these heated mattress pads have strong non-heating connection with flat cables. The controllers are flat boxes with a negative display with lit numbers that are easily visible in the night but not distracting. The temperature control is through up/down button. You can change it in the grogginess of your sleep and get it right. You can cycle through 10 settings of temperature. This mattress pad can also be pre-heated in the anticipation of your turning in for the night. The temperature control responds instantlyand you feel the change in temperature within a couple of minutes. It can go from full heat to cold in 10 minutes. This Sunbeam electric heated mattress pad has a 10-hour power cutoff which automatically shuts it down to save power. It is machine-washable once you disconnect the power cord and the controllers. Mild soap will do the job. It comes with a 5-year limited warranty that willcover manufacturing defects. Sunbeam Quilted heated mattress pads is available in a variety of thicknesses, qualities and controllers. The Quilted heated mattress pad with Dual EasySet Pro controllers is one such variation. It makes reliable claims at a very affordable price. It is a dependable buy for someone who is one a shoestring budget. Its specific controller is very tactile for operation in the dark. This quilted heated mattress is an excellent buy and deserves a place in the best heated mattress pads list. Sunbeam Quilted heated mattress pads have a nice vertical quilted design that stands out considering this is the top layer of your bedding. The construction is same as the previous product with 100% polyester design. The 140 thread count is enough for a comfortable feel to your back. The 5-ounce fill gives you some padding that keeps your back elevated from the wires. It is available in Twin, Twin XL Full, Queen, King and California King sizes. The skirting falls long enough to cover an 18” thick mattresses. This heated mattress pad features dual heating zones, each controlled via a handy controller each. The controllers are ergonomically designed and look like computer mouse. It has a large power button with a larger dial. The LCD screen for displaying the temperature is small in size. But it is easily readable with negative back display and lit numbers that are non-disturbingly visible through the night. With the knob, you can circle through 10 temperature settings per zone without putting on your glasses bang in the middle of the night. The controllers have non-slip feet that keep it level on the surface it is placed on. This Sunbeam heated mattress pad is equipped with Thermofine technology which maintains the temperature you set throughout the night. It has a 10-hour auto power down function. This saves electricity in case you forget to switch it off in the morning. It can be washed in the machine and dried in the dryer provided you handle it as a delicate product. Be sure to remove the power cord and controllers for washing. They offer a 5-year limited warranty on their product based on defects caused on the manufacturer’s side. It is quite comfortable in the sense that you can’t feel the wires through the mattress pad. The Biddeford electric heated mattress pad is a lightweight option for people looking to cut down their electricity bills in warm areas. It also provides the therapeutic heating to aching backs, necks and legs. It’s easy to use with handy controllers that respond quickly to your touch. The options of sizes and the easy maintenance routine helps keep it fresh as new. It takes an assured step into the best heated mattress pads list. 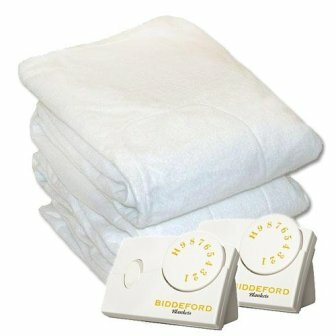 The Biddeford electric heated mattress pads are made in USA with imported parts. It has a soft microfiber topping that feels pleasant on you back. This is a pure polyester pad with skirted sides that cover the depth of the mattress. It is available in Twin, Full, Queen, King and Californian King. It is not particularly fluff but you don’t feel the wires. These come packed inside a zipper bag with handles. These heated mattress pad has both single- and dual-zone models. The Twin and Full models have only single temperature zone controlled by one controller. The King and Queen models have two controllers each. The dual zones can be used to customize each side to each sleepers’ preferences. The controller has an easily accessible knob with 10 temperature settings. The 10 settings range through the heat requirements of every season.The only other control is a power button. There are either silver or white models of controllers. They shut down on their own to save power. This Biddeford electric heated mattress pad is washable in machine at low temperatures. It can also be put in the dryer at low temperature settings. It is backed by a 5-year warrantyby Biddeford. The only design constraint is that the power plug is near the foot of the mattress than at the bottom. Some people might find this intrusive. It is durable for the price but you cannot expect the reliability of the expensive Sunbeam mattress pads. It’s definitely an improvement on the electric blankets which bunch up and run the risk of overheating. The Electrowarmth M60Fd heated mattress pad is a premium product with a wide variety of choices in terms of size and number of controls. The quality build is complemented by perfect fitment. The feel of the mattress under your back also hints at its premium status. 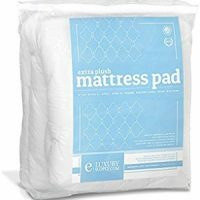 The easy maintenance and cleaning process makes it prime bedding even for those who are apprehensive about heated mattress pads.This US-made product finds a steady place in the best heated mattress pads list. TheElectrowarmth M60Fd heated mattress pad has close vertical quilting design which gives it an elite look. Made of 100% Polyester, it has a fitted skirt around the sides. It can cover mattresses up to 13 inches depth. It is available in 19 distinctive models that differ in size and number of controls combination. The more the number of controls, the more heat zones you have on the mattress which can be individually controlled in temperature. This heated mattress pad has white controller at the bottom. It has an up/down button with an LCD screen for displaying the temperature setting. You can select between 10 heat settings that can range from mildly hot to blazing hot for the harsh winters. The mattress quickly raises to the selected temperature. When you turn the mattress pad back on, it goes back to the most recently used heat setting. After 10 hours of continuous use, it powers down automatically to save power. This Electrowarmth M60Fd heated mattress pad has an emergency mechanism which shuts it down if overheating is detected. This lends conviction in its commitment to keeping you unscathed. It can be washed and dried in machine at a very gentle cycle. Electrowarmth stand behind its product with limited one-year guarantee and 30-day money back guarantee. This mattress pad also confirms to UL standard 964 in terms of equipment safety. The Sherpa Heated Mattress pad is one of Biddeford’s more expensive products. But this shows through in the quality of the pad through continuous use. Its plush luxurious feel ensures that the wires don’t poke in your back. The variety of heat settings and power conservation features. It is a reliable buy and makes its case for the best heated mattress pads list. The Biddeford Sherpa heated mattress pad is a 100% polyester product with a soft velour-like topping where your back lies on it. It has a soft warm texture of its own which masks the effect of the wire. The sides have an elastic skirt that can extend over a mattress of maximum 22 inches depth. The King Mattress pad stretches up to 76” x80”. This heated mattress pad has two very handsome controllers. It’s small and handy but the buttons are rather small compared to the total real estate. One side has a power button and the other side has the up/down buttons for cycling through heat settings. There are 10 heat settings to choose from based on the intensity of winter and your personal preferences. There’s a small LCD screen with negative display and lit numbers that are easily readable in the dark without being distracting. It has a 10-hour auto shutoff so that you can switch it off and forget about it. It will automatically cool down after 10 hours and power down to save energy. Both King and Queen size have dual temperature zones which can be individually controlled. This Biddefordheated mattress pads can be washed in the machine and dried in the dryer. It is packed with ultra-thin wires that don’t poke through the soft plush topping. The only issue is that there’s no uniformity between the pieces. This mattress is made in USA and the customer service supports you through problems. What if you have a young one in the house who is prone to occasional peeing accidents at night? Should you kiss your electric heated mattress pad goodbye? Not necessarily. The Serta Waterproof heated mattress pad is your solution. It can stand the infrequent coffee spill and general absent-mindedness. We couldn’t have thought of a more useful quality in one of our best heated mattress pads list. The Serta Waterproof heated mattress pad is made of a special cotton blend that resists staining. It is also waterproof through a TPU laminate layer so the marks from a coffee spill won’t stick as stubbornly as usual. While this model is designed like a usual pad, it also has another model with a removable heated pad at the top. This is useful if you have to frequently take off the heating arrangement. The model we covered is available in Twin, Full, Queen and California King sizes. As with most Serta heated mattress pads, this has evenly-laid network of thin wires that do not poke into the back like traditional resistance wires. This arrangement also ensures that there aren’t any cold spots left on the heating zone and you are uniformly warmed from head to toe. These have two temperature zones, each with its personal controller. This is a handy control with just one knob and a negative lit display. There’s no noise from the controller when you adjust the settings, so you companion can continue sleeping without disturbance. You can choose from 10 heat settings based on how much you feel the chill. It cools and heats up pretty fast. It goes to the Hi-heat setting and then gradually settles on the heat setting you selected. It also has the pre-heat functionality. Serta covers its bases in this heated mattress pad by including an auto power down function in case of overheating. After 10 hours of continuous functioning, it automatically powers down to save electricity. Serta offers a limited 5-year warranty on the product. Sunbeam has the most number of heated mattress pads in various configuration floating around this niche market. Their waterproof version is immensely useful when you are the hare-brained user who often spills liquids on the bed. It carries all the other usual functions within a reasonable budget too. Hence its place in the best heated mattress pads list. The Sunbeam Waterproof heated mattress pad has a nice hourglass quilted design on the surface. It is filled with 6 ounces of filling which translates to fluffy softness when you lie on it. It has a pure cotton cover with 200 thread count for decent feel to the sleeper. It is waterproof as the name suggests so it will survive a few water spills if you are particularly careless.It is available in Twin, Full, Queen, King and Californian King sizes. The skirt of the mattress pad can fit mattresses up to 19 inches in depth. This heated mattress pad comes with two hardy but compact controllers. It has one dim screen and five buttons. The up/down buttons are large and tactile. They can be operated easily in the dark. But the LCD screen doesn’t seem to light up to be visible. You get 10 settings of temperature that ranges from mildly warm to hot enough for the dire winters. You can set different temperatures for the two heat zones. It has a 10-hour automatic shut off which powers down the mattress after you wake up(tentatively). Sunbeams Thermofine technology is responsible for keeping the temperature maintained at the selected setting in the entire zone. This Sunbeam heated mattress pad can be washed and dried in the machine. This amounts to effortless maintenance to keep it sparkling clean. They offer a 5-year warranty on the product. The Sunbeam ThermofineQuilted heated mattress pad is one of their middle-of-the-road offerings. They have a decent feature set within a reasonable price range. It looks great on display even in a public room. It has received widely favorable reviews for the hassle-free design and quick heating. It gains a well-deserved place on the best heated electric mattress pads list. The Sunbeam Thermofine Quilted heated mattress pad is a moderately thick topper. It has vertical quilting which evenly channels the resistance components. Made of pure polyester, it is comfortable to lie on directly. It is available in 5 sizes: Twin, Full, King, Queen and California King. The Queen size is 60”x 80” and the King size is 76”x 80”. The skirting on each size is 18”which fits the standard mattresses easily. This heated mattress pad has 10 temperature settings which fits the requirements of all seasons. You can set temperature to your personal preference on your side of the bed. It has an auto shut off function which turns it down after 10 hours of use through the night. Even if you forget to switch it off, this padhas got you covered. The controller has a knob for the multiple heat settings. A small negative display with lit numbers show the temperature settings. Apart from that, the ergonomic controllers only have power button. This Sunbeam heated mattress pad has 5-year warranty backing it. It confirms to UL standards of safety for such products. 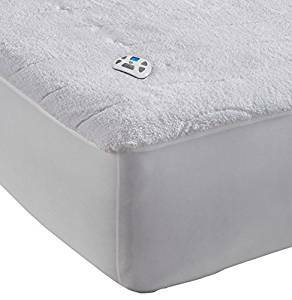 The SoftHeat Smart Heated Electric Mattress Pad from Perfect Fit with Safe & Warm Low Voltage Technology, Micro-Plush Top (Twin size) is an extremely safe and an amazingly soft electric mattress pad which warms the bed and at the same time rejuvenates it. The ultra-plush pad is extremely soft to touch and feel and at the same time it is very luxurious and supportive. The fabric top which is made out of micro-velour gives this luxurious feel. The mattress pad is a low voltage product, however, its warmth penetrates the whole bed allowing the user to conserve electricity on the overall warmth of the room by lowering the thermostat. The Safe & Warm low-voltage Technology is patented and it converts the 120 VAC mains power into a non-hazardous low voltage DC. 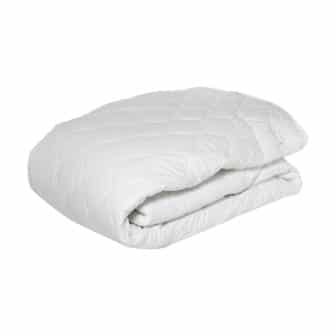 This provides not just warmth but is very safe and protective even in the event of the bed becoming et for some reason. The pad contains heating wires but these are so thin that they are almost non-noticeable. The SoftHeat Smart Heated Electric Mattress Pad from Perfect Fit with Safe & Warm Low Voltage Technology, Micro-Plush Top (Twin size) has got extremely thin heating wires as compared to many other warming pads in the market which comprise of many bulky type of wiring . These ultra-thin wires have been placed at a distance of 3 inches from each other and they are evenly distributed throughout the heating pads from head to toe. This way, the heating pad enables the even distribution of heat and there are no hot spots or cold spots produced across the heated pad. There is a computerized controller on board the heating pad which is extremely easy to read and is equally easy to turn. It can be heated to a pre-set temperature by turning the automatic pre-heat feature to HI to let it get to the desired temperature. In order to keep the heating pad safe and convenient, and to conserve power, over-temperature protection is provided to shut off the heating pad after a duration of 10 hours. This is important as the user might forget to turn off the heat sometimes. The heating pad is twin in size and has a product dimension of 12.6 x 15.8 x 5.9 inches while its weight is only 3.79 lbs. The SoftHeat Smart Heated Electric Mattress Pad from Perfect Fit with Safe & Warm Low Voltage Technology, Micro-Plush Top (Twin size) comes equipped built-in with a back-lit display which has got an auto-dimming feature which enables usage of the heating pad in dark areas or in the night without the need to turn on the room lights. The heating pad has got a fitted skirt which enables everything to be kept in place and thus eliminates any possible shifting or bunching of the pad. The heating pad is also machine washable and can be tumble dried. The heating pads distribute heat evenly. The pad is very safe due to the automatic shut-off feature. The heating pad is extremely easy to use. The Quilted Heated Mattress Pad from Holmes (King) provides unparalleled relaxation and warmth to the users. It boasts a very exquisite and decorative design which has been coupled with Onset control having 5 different personalized settings for heat. The heating pad also boasts a 10-hour automatic shutoff time to provide protection to the user and also to ensure conservation of power. This feature also offers a lot of convenience to the user as he/she might forget to turn the heating pad off. The quilted heated mattress pad has got a thread count of 250 which makes it quite strong and it is made out of 100% Cotton. 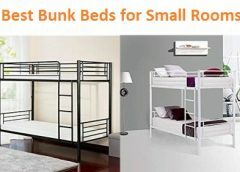 It can very easily fit mattresses which are up to 21 inches deep. It is possible to reduce power consumption by 10% as one can use the heating pad during the 8 hours in the night and at the same time lower the thermostat setting in the room by 10% to 15% which would result in the lowering of consumption of power. The heating pad serves the user for full 6 hours throughout the night and keeps him/her warm without the user requiring any heavy blankets or quilts or heavy comforters. 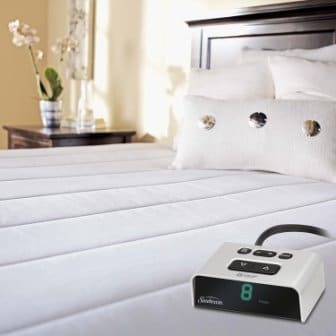 The Quilted Heated Mattress Pad from Holmes (King) has been designed and engineered to have the exclusive ThermoFine warming system senses which are instrumental in adjusting to delivering the warmth from under the sheets. The mattress headed pad comes with a 5-year limited warranty against defects due to material and workmanship. The King size mattress heating pad is 76 in x 80 in and it has dual heating controls. The package however has dimensions of 14 x 13 x 13 inches and it weighs 9.25 lbs. The heating pad has been designed work on 120 Volt AC and for use outside of North America, this might require the use of a voltage converter for these products to function in those regions or countries. However, as per the manufacturer’s policy, the use of a voltage converter would void the warranty. The heated mattress pad fully confirms to all safety standards of the industry and as such have been rigorously tested to ensure their compliance to these standards. Third parties like UL and Intertek have approved these products against these standards. 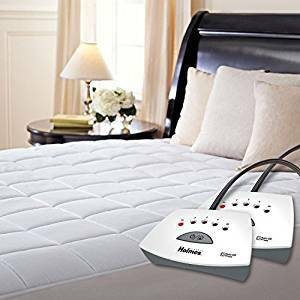 The Quilted Heated Mattress Pad from Holmes (King) is extremely simple to use and is simply plugged into the 120 VAC socket to operate. The heated mattress pad ensures warmth throughout the night for the user and also serves to act as an energy saver as the room thermostat can be lowered to decrease the use of electrical power and conserve valuable energy which results in money savings as well. 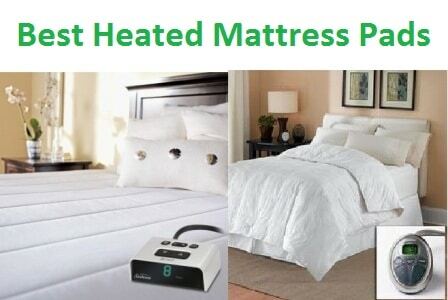 The heated mattress pad is a very safe product and the information rewarding its additional certification is easily available from the manufacturer’s customer service as well as from the UL and Intertek websites. It conforms to industry safety standards. The heated mattress pad has a 5-year limited warranty. Some people might need to run it at the lowest heat setting to avoid over-heating. 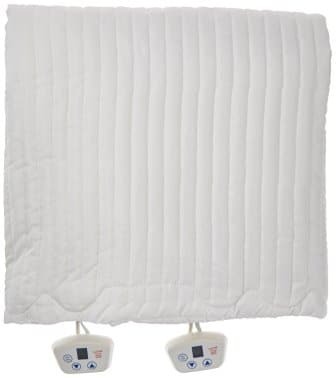 The Electric Heated Warming Mattress Pad from Perfect Fit, Dobby Stripe in White, Queen Size is an extremely safe and soft heated, mattress pad which provides warmth to the bed and also energizes it. As a result of the use of this mattress pad, the user can save a lot of money on a yearly basis as it would not necessitate the use of thermostat at high settings thus conserving both power and money. It is a low voltage pad so it is very safe to use. The thread count of this heated mattress pad is 233 and it is made out of 80% polyester and 20% cotton and this dobby stripe shell gives a very soft and nice feel and results in a surface which is very supportive and soothing at the same time. The Safe & Warm low-voltage technology is at the core of the performance of this heated mattress pad. The power supply box is small and aptly converts the 120 VAC from the socket to a low non-hazardous voltage in DC. This low voltage is enough to run the heating pad and provide the necessary warmth, safety and protection to the bed and to the user. The Electric Heated Warming Mattress Pad from Perfect Fit, Dobby Stripe in White, Queen Size performs perfectly well even if the bed gets wet for some reason. It does not have very thick and bulky wires like a lot of other hearing pads that are available in the market. Instead, the wires in this heating pad are thin and very soft. They are designed in such a way that they do appear to be noticeable. These wires have been placed at a distance of 3 inches from each other and have been distributed throughout the heating pad evenly from head to toe. This feature ensures even distribution of heat throughout the heating pad and therefore, no cold or hot spots are created anywhere in the heating pad. This heating pad is also divided into 2 different zones and therefore to go along with these, there are 2 computerized controllers which are very easy to turn and very easy to read. These are located on each side of the heating pad and this way; each side of the heated pad can be adjusted for the level of warmth desired by the user. This lets the user control the amount of warmth required as per his/her preference and ensures comfort as well as complete control. The product dimensions of the Queen size heating pad are 60″ x 80″ x 10″. 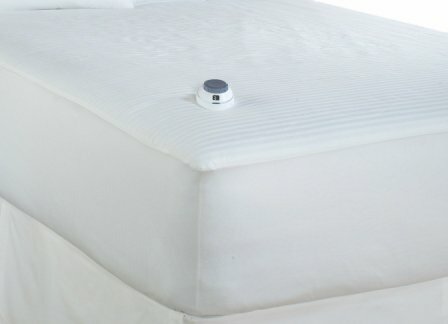 The Electric Heated Warming Mattress Pad from Perfect Fit, Dobby Stripe in White, Queen Size allows for sheets to become cosy as it has got an automatic pre-heat and hold function which enables pre-heating and the holding of the desired temperature to keep the sheets cosy before actual use. The heating pad is just turned on and the pre-heat feature is enabled as the dial is set to HI and the temperature would rise up to the desired level. It is also held at the same temperature. An automatic shut-off feature has been provided in this heated mattress pad which automatically shuts-off the heating pad after 10 hours thus ensuring safety as well as power conservation for the user. The heating pad is extremely safe as it uses low-voltage. Automatic shut-off feature ensures further safety and power conservation. It performs well even if the bed gets wet. Information on use of voltage converter outside North America is not provided. The Plush Velour Electric Heated Mattress Pad from Serta, Includes Programmable Digital Controller, Queen, White ensures that the user does not have to tuck in cold sheets ever again. The heated mattress pad is able to warm up the sheets even before the user actually gets into his/her bed and makes the sheets cosy. The use of 100-percent Coral fleece velour fabric is instrumental in providing a very high level of luxurious comfort to ensure a perfect night’s sleep for the user and his/her subsequent rejuvenation. In order to make the sheets cosy all that is required to do is to turn on the digital controller of temperature which is programmable and set it to one of the 10 pre-set levels of heat as well as the heating time. This would enable the heating mattress pad to heat up to the desired level and when the user gets into bed, he/she would find the sheets at the same temperature as the temperature level is maintained by the system. The heated mattress pad also ensures that the user does not have to get up in the middle of the night to readjust the temperature to another level. This requirement can be programmed in a time window of 12 hours and the user would always find himself herself at the desired temperature at all times. 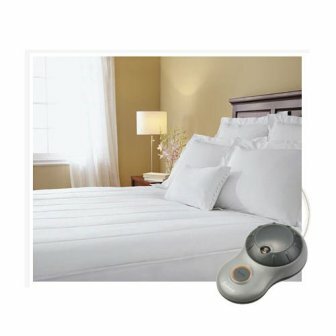 The Plush Velour Electric Heated Mattress Pad from Serta, Includes Programmable Digital Controller, Queen, White has dimensions of 60 inches by 80 inches and it includes 2 digital programmable temperature controllers which are used in two separate zones to get the best-individualized comfort for the user. Each of these 2 controllers is equipped with a power cord each which is 19 feet long. This allows the heating mattress pad to be placed at quite a distance from the power outlet and thus it allows for placement flexibility. This heated mattress pad has been designed and engineered to include many safety features which include automatic shut-off for over-heat protection after 10 hours of operation. This ensures not just safety but power conservation as well. The product dimensions of this heated mattress pad for queen size are 60 x 80 x 0.5 inches and the weight of the pad is very low at only 6.7 lbs. 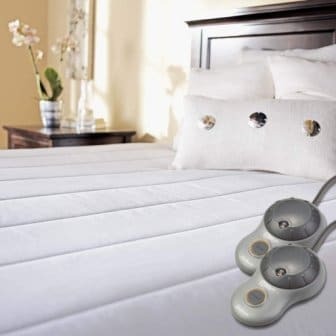 The Plush Velour Electric Heated Mattress Pad from Serta, Includes Programmable Digital Controller, Queen, White has been constructed with a flexible skirting that surrounds the heating pad on all sides and this way, it stays safely in place and allows for a perfect fitting of sheets. The user is able to save anywhere from 5% to 15% of his/her electricity consumption by the use of this heated mattress pad as it allows the user to turn down the level of the thermostat by anywhere from 10 degrees to 15 degrees for a period of 8 hours. The manufacturer also provides a limited 3-year warranty which covers defects due to material and workmanship. The product can be washed in a washing machine very easily. The heated mattress pad is very safe as it uses low voltage to heat the mattress. The heated mattress pad allows for power conservation. Some users might prefer one power cord for both heating zones. The Serta/Sherpa Plush Electric Heated Mattress Pad from Perfect Fit, Includes Programmable Digital Control, Model 0916 (Queen size, White) has been designed and engineered to war up the bed sheets of the user before he/she goes to bed and provide warmth and comfort throughout the night for a perfect sleep experience throughout the night and the ability to wake up fully rejuvenated in the morning ready to face the hectic day ahead. The cosiness of the bed sheets is ensured by turning on the programmable controller on the heated mattress pad and simply select one of the 10 pre-set levels of heat as well as the desired heating time and the heated mattress pad would follow suit with exactly what is desired. Even in the middle of the night, there is absolutely no need to wake up and readjust the heat setting to another desired level. this can be programmed as well and the heated mattress pad would set to the new level at the desired time within a 12-hour window. The Serta/Sherpa Plush Electric Heated Mattress Pad from Perfect Fit, Includes Programmable Digital Control, Model 0916 (Queen size, White) is equipped with 2 separate digital programmable controllers as well as 2 heating zones while the total top area of the heated mattress pad is 60 inches x 80 inches for Queen size. Each of the 2 programmable controllers has a power cord of their own and each power cord is 19 feet in length. This length of the power cord enables an easy placement of the bed anywhere in the bedroom as it can be placed at places which are away from the power outlet. The heated mattress pad is equipped with safety features like overheat protection and automatic shut-off after the pad has been on for 10 hours. This ensures not just safety for the user and protects the mattress pad from overheating, it also enables the user to save a lot on power consumption. The heated mattress pad has got product dimensions of 60 x 80 x 0.5 inches and it is very low in weight at only 5.7 lbs. 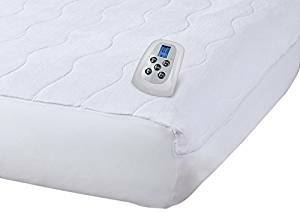 The Serta/Sherpa Plush Electric Heated Mattress Pad from Perfect Fit, Includes Programmable Digital Control, Model 0916 (Queen size, White) boasts a flexible skirting on all 4 sides of the heated mattress pad. This feature ensures that the pad remains stable and well in place. It also allows for perfect fit to both sheets as well as mattresses. The user is also able to save both power and money by lowering down the temperature settings on the thermostat as the heated mattress pad keeps the user warm throughout the night. If the thermostat is lowered by 10 or 15 degrees for 8 hours, the user is able to save at least 5% to 15% on the electricity bill. The machine washable heated mattress pad is provided to the users with a 3-year limited warranty by the manufacturer. It covers defects both due to the material as well as workmanship. This heated mattress pad is very safe and comfortable to use. It has an automatic shut-off and overheating protection. The heated mattress pad results in power conservation.